If your spouse dies and his will either omits you or explicitly denies you an inheritance, state spousal election laws allow you to disregard the will. You may be able to claim an inheritance up to a certain amount defined by each state's law -- usually between one-third and one-half of the estate. This right of election supersedes attempts by a spouse to give away property before his death that would otherwise be inherited by the surviving spouse. Some states require that the spouses be living together at the time of death to qualify for the spousal election; other spousal election laws may not protect you if you were omitted from a will under the terms of a valid pre-marital agreement. After-born child laws protect children who may be denied an inheritance, not through intentional omission, but because they were born or adopted after the testator wrote his will or born after the testator died. Although parents may legally intentionally disinherit their children in many states, after-born child laws presume that a child born after a will was executed and who is not mentioned in that will was simply omitted by error and should inherit similarly to any other children in the will. To qualify as an omitted child under most state laws, the child must prove that she was born or adopted after the will was executed and that the omission was inadvertent with no other reason why the deceased parent denied the child an inheritance. Under some conditions, children conceived posthumously -- an increasing occurrence due to advances in reproductive science technology -- may be considered after-born children under state inheritance laws. A child born outside of marriage who was not acknowledged by her biological parent as being that parent's offspring, and who was not explicitly disinherited in that parent's will, may be able to claim her inheritance under omitted child laws, but these laws differ from state to state. A 2011 Oklahoma Supreme Court ruling allowed an unacknowledged child who had been put up for adoption at birth, but who proved paternity through DNA testing during probate, to inherit as an unintentionally omitted heir. But a 2011 New York case ruled that two out-of-wedlock children who had been proven by DNA testing and even acknowledged by their biological father before he died could not qualify for protection of that state's omitted child laws because they were born before the will was written and not after. If you were denied an inheritance due to fraud or coercion of the person making the will, you may be able to avail yourself of state laws that allow such wills to be challenged. Wills can be challenged in probate court if they were improperly executed; if the testator was not of sound mind at the time the will was signed; or if the testator was subject to undue influence pressuring her to include or omit a particular heir. 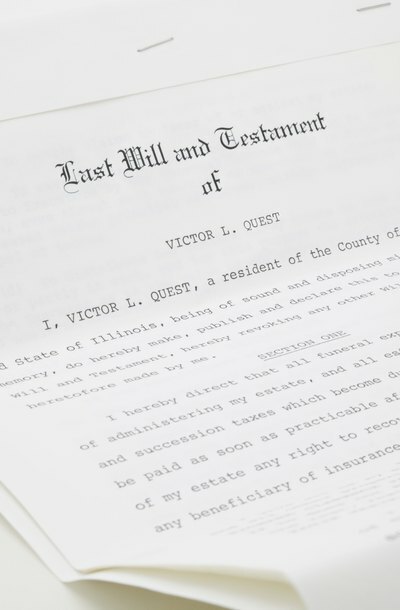 You may also be able to challenge the validity of a will that denied your inheritance if a later will was written by the testator to correct the omission, but which has not been presented to the probate court. Can You Bypass an Heir in a Will? Ronald A. Jones Attorney at Law: Can I Contest or Challenge a Will?